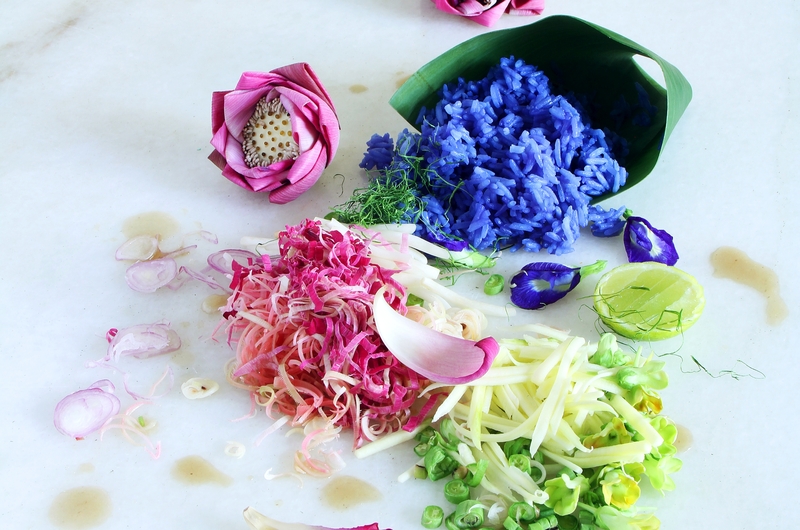 NASI Kerabu gets its colours from the vibrant blue of the Butterfly Pea flowers. To add on to the flower theme of the dish, why not combine it with a refreshing flower salad? In a saucepan, bring anchovy and chicken stock to boil over medium heat. Lower heat and simmer for 5 minutes. Add lemongrass, galangal, shallots and kaffir lime leaves. Season with sugar and salt. Remove from heat and strain. Place the rice along with the blue water into a rice cooker and cook till fluffy. In a bowl, combine the salad ingredients, except the lime slices, with the anchovy sauce and rice, mixing well. Serve with lime slice.